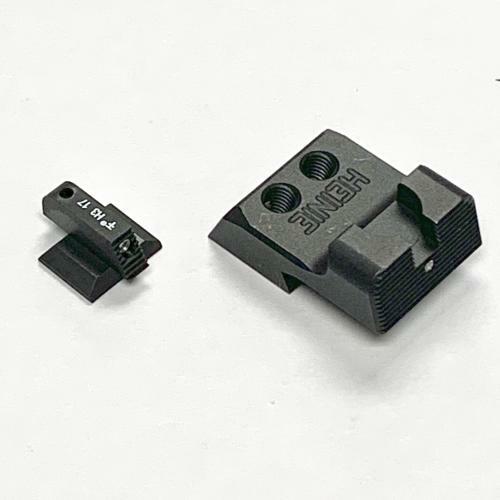 Springfield EMP Tritium Night Sight Set - Heinie Specialty Products, Inc. This sight set features our rear Ledge design. The military inspired sight design combines the best features of our Classic and SlantPro with a few of its own that sets it apart from your target or EDC sight. Equipped with a wide square notch for quick acquisition of the front sight, the rear face slants forward and is serrated with contoured edges (so it can be carried every day without worry of snagging). The Ledge was designed with a lip that allows the operator to cycle the slide with one hand easily, giving you an advantage in any situation. The Heinie Straight Eight night sight system puts this set over the top as a must have. One single tritium insert in the rear (for low-light and night-time shooting) that aligns vertically with the single tritium front insert (when used as a set) creates a distinctly clear sight picture. This vertical alignment is proven to be faster and less confusing for the human eye. The cross dovetail front sight face is also serrated with one tritium dot (no insert) that glows in the dark. Minor fitting of the front sight may be required for installation but does not require modification to your slide. Front sight has blued finish, rust preventative is recommended.